Choreographer and Clinician, and VEEP! Hey there! 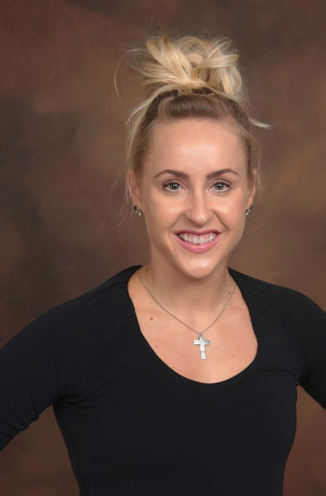 My name is Kristina and I have been involved in gymnastics for over 22 years. I was a three-time member of the U.S. National Team from 2002-2005. Once I graduated High School, I moved west to become a part of the UCLA gymnastics team. I became a 5-time All-American, runner up on vault my Freshman year and bars my Junior year. College was some of the best years of my life. I learned so much more about gymnastics than I ever thought possible. I had some of the best coaches around including Chris Waller and Valorie Kondos-Field, who is widely regarded as one of the most creative choreographers around. Watching and learning from her was one of the most priceless experiences I could have asked for. While attending UCLA, I took hip-hop and breakdance classes with gymnast and b-girl, Ariana Berlin and continued to learn more and more from “Miss Val.” Once I had to medically retire my senior year, I stayed on as an undergraduate assistant coach. That year, I worked closely with Vanessa Zamarippa on Beam, helping her become an AA around contender. I also helped my teammates win the NCAA National Championship. I have been choreographing since I was 18 years old at my former club team, IGI. Since I graduated UCLA, I have continued to choreograph in the Chicago area. I had seen Alicia working with Precision for years and had wanted to be a part of such a creative team and unit. Well, I’m here now and excited to hit the ground running with Nicole and all of you!